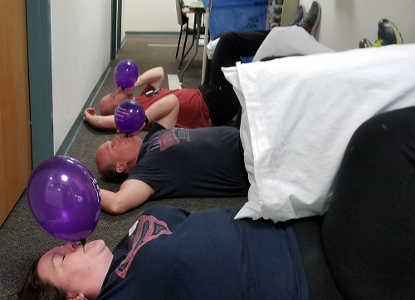 This past weekend I had the pleasure to present Postural Respiration to a diverse mix of new attendees and "veterans" of PRI at Pro Sport in Redmond, WA. I would rename this weekend "Superior T-4 Syndrome in Seattle" considering how many course attendees presented with this patho-mechanical respiratory compensation and asked so many questions about patho-mechanical rib kinematics as it relates to this subject! We had an opportunity to demonstrate in front of class at least four students that looked like they could possibly be patho-mechanical in terms of their respiration and body type. One take away is you may suspect a positional issue but always test and retest. Two of the students demonstrated the definitive assessment of decreased left apical expansion after a Superior T-4 manual technique. Superior T-4 came up during discussion on Saturday and was a topic that came up often during the entire weekend on how to define, assess and then treat it both manually and non-manually. One of the students that had non-manual techniques provided experienced the left side of her body in a way that she expressed with an enthusiastic smile and a new place that she could feel and find in her body! In addition, she felt a bit "unstable" when she first started walking and liked it! Welcome to variability! 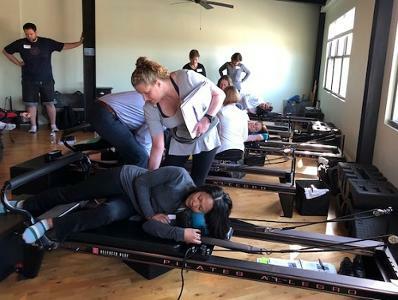 She not only found neutral, but she experienced transitioning right to left side and back again, alternating and reciprocating, lateralizing and realizing what tri-planer position, gait and breathing is all about. What a lesson for all to see, experience and what it means to reduce the reliance on end-ranges driven by asymmetries, respiration and patterns driven by neurology! The enthusiasm and new awareness of Superior T-4, especially for students new to PRI, was totally fun for all involved including this instructor! Thank you PRI dedicated veterans Erin Rajca and Michael Ball, both PT's and PRC's, for their help and knowledge. This course was a joy for all with them in attendance providing energy, experience and caring. Thank you Cory and Amanda for hosting at PRO SPORT and all of your hard work! And shout out to all of the students in attendance for your most outstanding questions and persistence in wanting to understand PRI principles especially regarding Superior T-4. Saranac Lake, NY, was the site of the most recent Myokinematic Restoration class, and it was a very eventful class for a variety of reasons. One of them was the 4-6 inches that fell Sunday during the course. It was a very beautiful scene, until you realized it was April 29th. More importantly, it was a course where we had the opportunity for as much, if not more, lab time compared to any course I have taught previously. We were fortunate to have two experienced and great lab assistants, Michelin Carroll, PT, ATC, and Sean Fitzgerald, PT, PRC. They have been in and around PRI for a long time, and having them help in lab was invaluable. My thanks to them! We were able to delve into the differences between normal mechanics the L AIC pattern presents, as well as normal and pathological compensations that will arise. This led us into the polyarticular behavior the muscles of the pelvis and femur have on each leg as a result of the L AIC pattern. We were fortunate to have a lot of time to practice the positional assessments, as well as discuss what the positional tests indicate. The value of the Hruska Abduction and Adduction Lift tests relative to the gait cycle and respiratory cycle was a significant topic of conversation and lab. We were fortunate to have two very good demonstrations with Matt Powers and Brendon Olsen. Matt gave us a good example of how to reposition someone who is in a L AIC pattern. And Brendon gave us a great example of how to get someone who is in a PEC pattern, and help them become inhibited enough to turn into a L AIC pattern. My thanks to Shauna Thomas for helping us link the L AIC pattern to what she is seeing in her womens' health population; Megan Haught for her great questions and re-states; co-workers Bill Doherty and Linda Horizny for their enthusiasm in learning this new material; and Hilary O'Connor, who is a student physical therapist attending this course. We all need a little more "Bruce Wayne" and a little less "Batman," and we need to make sure we have the proper "boy band" in our lives! This past weekend the PRI Fitness and Movement course was sold out in Salem, Oregon and the entire west coast from represented from California to Alaska. Thank you to all that attended and traveled in! It really was a great group! The audience had great diversity with personal trainers, strength coaches, physical therapists, chiropractors, massage and fascial bodyworkers, CrossFit and fitness enthusiasts and it was awesome to see them all working together to learn and enhance their understanding of the PRI science and key biomechanical relationships. This weekend was jammed pack with a ton of lab as I broke down the complex core axial system into digestible parts which could be trained. Breathing patterns along with thoracic and pelvic positions were emphasized to enhance neuromuscular and biomechanical patterning. Great discussions and lab experiences were had all around. Special thanks to Salem’s hidden gem - The Press Room - for hosting, Aaron Hague and his team were gracious hosts and a special shout out to PRCs Minh Nguyen and Joy Backstrum for helping make lab an enjoyable experience for the large group we had! The abs were reshaping the pancakes... and attendees we were feeling the parachuted love! We will be at the University of Vermont next month and then North Carolina and California. This course keeps getting better and James and I hope to see you there! Check out the Affiliate Course page for more details and be sure to program in some summertime learning today! The Pelvis Restoration Home Study has been updated! If you ordered the Pelvis Restoration online home study course between November 1, 2017 and May 1, 2018, we would like to offer you 2 weeks complimentary access to this newer version. Please contact us at (402)-467-4111 or fill out our contact form to receive your complimentary access (you will not receive additional CEUs). You have until June 30 to start your access. Jennifer Poulin is the instructor for the newest version of this course, which has over 13 hours of content. Over the past year, our faculty and staff worked together to update the structure and flow of this course. The core material has not changed however there is more detailed information on treatment algorithms including the relationship of the Hruska Abduction Lift Test. We had a fantastic weekend at Pilates Central presenting the second ever PRI Integration for Pilates course to a stellar audience that brought a fun and energetic vibe. I really love presenting a two day course with 2 other faculty members because we can showcase each other's strengths in a complementary way and it increases the likelihood of course attendees connecting personally with one or more of the presenters. Donna Parise Byrne and Sarah Petrich are two professionals that bring a strong combination of experience and ability to the table and the course attendees just love them. 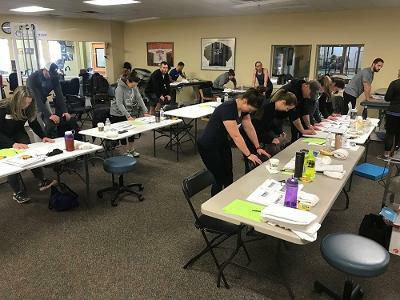 We welcomed a dynamic group of physical therapists, pilates instructors, strength and conditioning professionals, athletic trainers, massage therapists, personal trainers and students. Thank you Jenny LaForest, for bringing your interest in pediatrics all the way from Missoula MT, and Danny Jackowicz, for bringing your interest in performance training all the way from Erie PA. When people who are not in the world of Pilates realize that adding Pilates can powerfully enhance what they do, its awesome. Thank you Glenna Nall, for being a competitive olympic lifter who appreciates the value of breathing and proper core integration, and Mark Cibrario, a personal trainer who still plays high level baseball with athletes 25-30 years younger than he is and doesn't miss a beat. I love it when our attendees really put the principles we teach to work in their lives to enhance body durability and career longevity. I also wanted to thank Deb and Angel Giordano, the dynamic mother daughter team that brought so much to the weekend. Deb, I know you have a long history with Donna and Pilates Central. Thanks for bringing Angel, because her questions were so helpful to the flow of the class and definitely made the experience better for the rest of the class. It was also special to have Elizabeth Hodges attending this course. She is the one and only PRI Integration for Pilates model for all of our exercise techniques. Her contributions to the manual will continue to bless others for a long time into the future. Thank you Elizabeth and thank you for coming. Speaking of the PRI Integration for Pilates exercise techniques, I just love what the reformer and the chair allow us to do in terms of creativity, adaptability and successful delivery of muscle and movement integration. I mean, where else does Supine Left Stance with Right Rectus Femoris and Sartorius become Left Leg Footwork Right Develope, Supine Supported 90-90 Synchronized Resisted Glute Max become Butterfly Breathing Thighs in Loops, Supine Supported Thoracic Inhibition with Serratus Reach become Feet in Loops Reach, Paraspinal Release with Left Hamstrings become Seated Gymnast Prep, Standing Left AFIR with Right Glute Max become Left Stance Scooter, Standing Left AFIR with Right Abduction become Speed Skater and Standing Left Posterior Mediastinal Expansion with Alternating Weight Shift become Standing Walking Elephant? I could go on, but you get the idea. Please consider joining us for one of our upcoming courses this year in Albany NY, Minneapolis, MN or Novato, CA. I returned this past weekend from a tremendous weekend of learning with an authentic group of learners in Colorado where Pelvis Restoration was on tap. I had the pleasure of being hosted once again by Jonathan Pope and his team at Train Rogue/Ethos Colorado Training Facility and I was reconnected with my friend Craig Deppershmidt, DPT, PRC as well as newly certified Karen Stillahn, PT, DPT, ATC, PRC who combined to provide a luxury PRC tag team during labs, much appreciated by all in the course. From LMT to OT to PT to DC to ATC to CSCS, this group of movement scientists brought it! This course was packed with great discussions about LAIC and a bilateral AIC pattern that can lead us to using a PEC pattern to overstabilize a system that can lead to pain and/or pathology. We had thorough discussion of inlet and outlet function, urogenital diaphragm function related to position and relative order of operations for allowing anterior pelvic diaphragm function. We dove deep into how special tests correlate with one another to give a thorough, layered assessment of position, the pattern involved, compensation for said pattern, and pathology if present. From there, this group was keyed in on great clinical application of developing appropriate PRI facilitation programs to oppose the respective patterns identified, with inhibition components implemented when needed, with specificity attained with special tests. Pelvic and thoracic diaphragms were center stage. We enjoyed a good discussion and lab series with case studies in the fold, with treatment appendix reference and application being the focus of discussion late. This group was engaged, focused, with great clinical questions and facilitation of discussion by Craig, Charles Fairbanks, Margaret Randolph, James Park and others. Thank you Kyler Crouse, Ellen Kindelsperger, Jonathan Pope, Sharon Petty, Nathan Olson and others for your time and assistance during lab demonstrations. Thank you all for a weekend that flew by, so engaged with this lively, friendly group that I forgot to take any group pictures! Colorado intense! Thanks again to all. 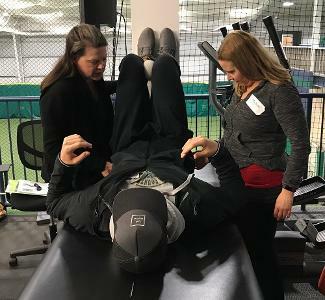 Philadelphia – “City of Champions” – provided good karma for the latest Postural Respiration course, hosted by Jon Herting, DPT, CSCS and Rob Rabena, MS, CSCS at Maplezone Sports Institute/The Training Room Physical Therapy. This was the first PRI course for half of the attendees. 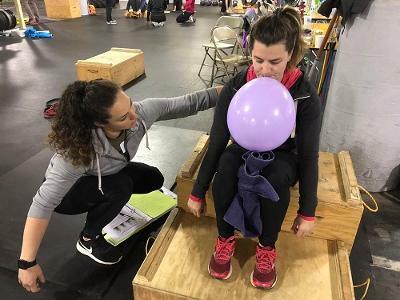 The class comprised a mix of PTs, PTAs, strength and conditioning specialists, coaches, massage therapists, and student PTs, with a range of experience and patient populations. Artem Imnadze, Nick Perugini, and Chris Stires, our students, confirmed that, still, there is virtually no discussion in the PT curriculum of the diaphragm’s functions. We addressed that short-coming through in-depth analysis of our lateralized diaphragm and its impact on human movement, physiology, and behavior. Ample time was devoted to testing and re-testing, following non-manual and manual techniques, to ascertain the each person’s degree of patterning and how challenged, or effective, they were in achieving tri-planar diaphragm position and activity. Participants learned that orthopedic dysfunction stems from our neurology and the patterned diaphragm. Therefore, breathing patterns and associated rib movement (or lack thereof) must be assessed and addressed to ensure recovery! Many mentioned they had “aha” moments throughout the course. Others had patients in mind that they planned to apply the material immediately. Thank you to Jon and Rob for hosting and to Jon and Frank Mallon, DPT, PRC, for your outstanding assistance with lab and clarifying concepts. Special thank you to Alfredo Aviles, NSCA-CPT, Ray Carr, DPT, Christopher Carroll, DPT, NCS, Justin DePermentier, DPT, ATC, Leor Giladi, DPT, CSCS, Tracey Emrey, MSPT, Michele Kersman, PTA, Nicole Ledbetter, LMT, Sheree McMullen, PTA, LMT, Jennifer Nieberlein, PT, ATC, Akil Piggott, DPT, Karen Vozzella, DPT, Michael Wehrhahn, DPT, CSCS, and Ryan Wolff, DPT for your insights, reading aloud to the group, modelling for lab, and setting up and taking down. 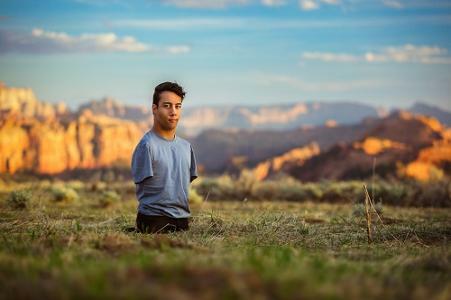 We are excited to announce that Gabe Adams, and his father Ron will be joining us at our annual Interdisciplinary Integration Symposium on Thursday, April 19th from 5:45-7pm for a “Conversational Presentation.” Gabe Adams was born in Brazil with Hanhart Syndrome, a genetic disorder, leaving him with no arms or legs. Adopted by his Utah family, Gabe is an amazing example of rising to the challenge. Despite his challenges, Gabe is an extremely independent 19 year old young man, and lives an amazingly “normal” life. He even made the dance teams at both Davis and Desert Hills High Schools. He recently graduated high school and has begun his career as a motivational speaker. James Anderson introduced us to Gabe a few weeks ago, and we knew right away that we wanted to meet this incredible young man and his parents. With our upcoming Symposium topic, “Postural Restriction: An Interdisciplinary Approach to Alignment of Functional Patterns”, we will have several speakers discussing neurological and soft tissue tension. After seeing Gabe move with very little tension or resistance placed on his body, including dancing, climbing stairs, and being so incredibly independent with daily life activities, we knew this would be a great opportunity for all of us to learn more about Gabe and how he navigates through life with his trunk, head and neck. There is no doubt Gabe’s story will inspire you, and the opportunity to meet and learn from Gabe about his movement patterns and how he has gotten to where he is today is a once in a lifetime opportunity that will not only impact your professional practice, but also your personal life. To learn more about Gabe, please visit www.limbitlessgabe.com. A limited number of seats are still available for our Interdisciplinary Integration Symposium on April 19-20th in Lincoln, NE. CLICK HERE to register today! Hello PRI family! I just returned from the great Northeast in Maine where I enjoyed teaching a Pelvis Restoration course with a diverse group of movement scientists from many professions. Many thanks to the team at Coastal Orthopedics and Sports Medicine Physical Therapy for welcoming PRI into their beautiful clinic. Special thanks to Brian Bisson for leading the hosting effort and taking time to make my experience in fluid, top to bottom, so we could stay focused on restoring pelvis function. Thank you also for Michael Mullins, PTA, ATC, PRC for continuing to be an ambassador for the science of PRI in the Northeast and beyond, for putting me up and for the best scallops I've ever had! A+ for all hosts! 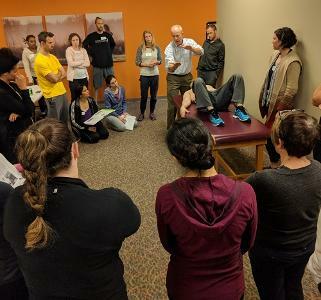 This course was filled with eager clinicians who were particularly interested in how to integrate a pelvis with a L AIC and/or a PEC overlay so their clients can return to full function and meet their functional and athletic goals. There was a good discussion and a long span of time taken demonstrating about how to reposition a PEC patient effectively from day one with focus on instant clinical application for a variety of settings. There were many with excellent questions about facilitation techniques and what muscles specifically are involved on which side and how each of said lengthened or shortened state muscle affects each quadrant of the inlet and the outlet--a very intuitive group! Thank you Kyle Neagle DC, Amy McManus DPT, CSCS, Rick Sirois MS, LATC, CSCS, Sarah Coughlin LMT and others for your help with modeling patterns during lab demonstrations. What a thorough job this group did during lab demonstrations of both tests and techniques! Looking forward to seeing this group of learners in PRI circles for years to come, thanks to each for your attention and learning effort last weekend! As an instructor, it so fun to be able to teach close to home and have a "home game." I had the pleasure to work with a great group of movement professionals from a variety of backgrounds. It was great to have Mark Cibrario host us for the weekend at his gym, The Trainers Club. It was also so fun to have Ieve Deleon, PT, in attendance. Ieve and I worked together for 5 years, and having her in the audience was very special. Every course has an opportunity to be lead by the attendees based on their questions. And the questions we had this weekend were on point, while giving us the opportunity to expand our concepts, and still stay on task to achieve our educational goals. My thanks to Michael DuBois, Gena Vernon-Davis, Ninna Wang, Andrew Eliszewski, Ryan Levonyak, and Brad Thurman, among others. We had so many contributors to our successful weekend. Kathryn Lehner and Kyle Tynan were very kind to let us learn from them and be our models for the weekend. The fun part of the weekend was our lab time. We were able to spend a lot of time in lab working on positional tests, and the Hruska Abduction and Adduction Lift tests, We also were able to work our way through activities related the management of an individual with a pathological L AIC presentation, from activation to inhibition. "Home games" are infrequent, and to have the opportunity to have had such a great group to work with, learn from, and interact with was truly the best part of the weekend!